Autumn Mega-Empties 2017 - Would I Re-Purchase? This post has been little overdue - I had other fun posts in the publishing queue and so much empties to go through! Meanwhile I've accumulated even more empties, but those are going to wait for my next post. Personally I love when people share their trash.. I mean used up products. I'm always curious what was worth using up? Would you repurchase? This is when we as consumers get to say the final word. Enjoy, it's going to be a long one! Very nice gel cleanser in a generous, long-lasting bottle. I like to use this either as a morning or second cleanser. Leaves a nice clean feeling, but doesn't dry my skin out or leave it feeling too squeaky clean. Not very pricey, around £24/27€/$32. I purchased my first bottle myself and got another from January. Will keep using and repurchasing this one. Full review here. Another favorite for January. This was actually used by my boyfriend, he has gone through several tubes. Many males in my life are not into skincare, but this is the moisturizer I like to gift and recommend them as it's light in texture and absorbs quickly. Fuss-free and again – not very expensive. January's products are also very cleanly formulated and effective, so I happily recommend them. I think this might be my first empty bottle of the Night Cream. January's Day Cream is my staple moisturizer, but the Retexturizing Night Cream doesn't get as much love. In the evenings I like to layer my face with oils and balms over a serum - a night cream simply doesn't fit my routine. I've also been mostly happy with the texture of my face (knock on wood): if there are any bumps surfacing I'll reach for January's Daily Brightening Tonic in the mornings. If you're in a need for a good, gentle yet effective acid exfoliant, this cream is a great choice as it's packed with Lactic Acid. I think I will return using this cream as soon as I finish some of my facial oils. As much as I tried, I didn't get on with this exfoliant. I loved the idea of it, texture and spotlight ingredients, but the mask itself didn't do much for me. It's also very valuable mask, so I expect a noticeable difference, which I didn't get. If you're looking for a brightening mask I recommend get a sample of this first, if possible. I've heard there is a "pro" or "heavy duty" version of the Power Peel Exfoliant, which I haven't tried. Full review here. No kidding, I almost have the whole January Labs line reviewed here! This eye cream I actually did quite enjoy. Most of them seem to do nothing at all and it's down to the hydration, texture and moisturizing qualities. January Lab's eye cream is quite pricey, but performs well: lightweight on the skin, but nice and plumping. Nothing will get rid of my dark circles or fine lines, except temporarily plumping them, but overall I think this is a safe bet if you're looking for a high quality eye cream. I think I'd repurchase when it comes on sale (I shop mine on Cult Beauty). This serum was had a pleasant light texture like a lotion, but I didn't find it particularly memorable. I would dare to say this is one of those eye creams that you won't notice doing anything. Right now I'm just taking all oils, serums and creams near my eye area instead of a specified eye product although I do like the Verso and January Labs eye creams. If you're wanting to try Pur~lisse, get the sheet masks or the basic facial cleanser instead. Basic, unoffencive foam cleanser. No need for a mini loofa as the cleanser comes conveniently out from the pump bottle as fluffy foam. Unlike many foaming cleansers, I didn't find Hadalabo drying at all. It isn't as luxurious and decadent as Sulwhasoo's foam cleanser, which I'm lovingly using right now, but still worth of re-purchasing. Again, very basic, but very well-performing product from Hadalabo. This lotion (more like hydrating toner) is packed with hyaluronic acid, light-weight and absorbs quickly. Excellent pricing and a generous bottle - no wonder it's a classic among lovers of Japanese skincare. Will repurchase! I feel like I've talked about this sunscreen for a thousand times.. not really, but I've gone through at least 10 tubes of it without any exaggeration. This sunscreen was previously known as Eco Safety Perfect Sunblock, but at least in day-to-day use the feel is the same. Now my most recent tube is labelled both water-resistant and for dry skin, but I'm unsure if Innisfree provides a lighter version of this one. Indeed, it's on the creamier side and possibly a bit heavy for oilier skins, but my skin loves its moisturizing qualities. There's no bad white-cast and it truly seems long-lasting. Will repurchase (forever). Review here. Not worth the hype. I think my Mom enjoys Glamglow masks, her skin is ageing and oilier than mine. Personally Youthmud mask felt just uncomfortable and drying, I didn't like it at all. I'm glad I didn't purchase a full size but a mini, since the mask dried out and I lost at least 3/4 of the product. I rarely use micellar or cleansing waters, but sometimes I wear a lot of eye makeup and it's easier to remove to bulk of it before going in with a balm cleanser. This cleansing water was very good, non-drying and performed well. The only con was I broke the cap before I had used it all up. Otherwise the bottle does look beautiful in one's bathroom cabinet. What stop me from repurchasing is the hefty price tag. If you can pick it up on sale, I think it's a very nice one! Ah, I did have love-affair with Kypris' Antioxidant Dew. This serum was so hyped up on YT and blogs I felt hesitant to pick it up, but ended up doing so with little expectations. Overall I found this serum very nice; nourishing, plumping and hydrating - layered beautifully under other moisturizers, sunscreen and makeup. I think this falls to the category of hydrating serums where is a lot of competition, but in the end I think I will repurchase the Antioxidant Dew. I already got the Moonlight Catalyst from Kypris and I can't wait to discover more from the brand! Excellent light-weight hair oil for healthy shine and tame the frizz. I have quite coarse and thick hair with little to no damage, but I do heat style from time to time. I used oils in the hopes of getting that silky smooth hair like in Asian TV ads, but it didn't happen. Still, from the hair oils I've tried OUAI is on the good side. The scent was okay, a bit too floral for my liking, but it didn't linger too much. Would repurchase, but next I'll try the rose body and hair oil from the brand and see if it works for both purposes! This serum I loved. It's similar to Kypris Antioxidant Dew in texture, hydrating and plumping qualities, but with added Vitamin C boost. You need something more heavy-duty to fight sun damage, preferably in a darker bottle, but Luxe Botanic's Camu Serum is a good option if you need an all-arounder serum for healthy and bright complexion without needing to worry about the ingredients (they're great). Full review here. Another Holy Grail product from Japanese drug stores. DHC cleansing oil is a classic, but much more affordable than Shu Uemura for example. It removes makeup, dirt and grime from your face effortlessly. I personally add little water to emulsify to texture, but you can use it with hot cloth just as well. This was a limited edition bottle with Alice in Wonderland packaging, which I'm going to save as I love Alice! The cleanser lasted me for many many months, so I would definitely repurchase. This cream was hyped up in the Korean beauty community. I guess it had a clean ingredients list with high hydration properties and fun texture, as it felt like gloopy jelly. The original packaging had a nice touch with paper and ribbon on the top, making a standard glass jar looking like an antique pot, but I discarded the decoration after first use. While it was an okay standard moisturizer I didn't like sticking my fingers or a spatula into the pot. I think there are much nicer creams available if you dare to spend little extra $$$ (look into NUORI and January Labs for example). This was my decadent body creme purchase from last year. I really wanted the Soy and Honey? version, but it was sold out in the large size. Quite expensive for a body moisturizer - at least in Finland, where Khiel's is prized as a premium brand. The scent was mediocre, but moisturized nicely. Although I've tried some divine body oils in the mean time, I still miss this tub of body cream. Its texture was simply very nice, whipped cream. If I can get the soy and something scent, I think I'll repurchase a smaller jar. I remember getting this in my Beautylish Lucky Bag, but it took me quite a while to start using it: the packaging isn't very attractive in my opinion and I hadn't heard much about the mascara either (now I keep seeing it everywhere). But it was good. If my memory serves me right it didn't quite have the va-va-voom or spider leg effect I look for in a mascara, but nice, didn't go all over my face and used it up. Wouldn't repurchase as there are more exciting high end mascara launches in the market. Still, I usually go for Japanese drug store mascaras: D.U.P., Heroine Make, Mote etc. (like the one in the pictures, I just can't recall the name) as they're cheap, won't smudge and give nice length to the lashes. Hydrating lotion I used for the body, non-sticky and felt light on the skin. This bottle lasted me a while, but I wouldn't repurchase as I'm quite lazy when it comes to body care and I need something much heavier when I moisturize. FAB isn't sold here locally and I only re-order more memorable products online. If FAB is easy for you to access and you like lighter moisturizers, it isn't a bad one. I have a bit conflicted thoughts about Deciem brands.. When they first launched Hylamide and NIOD I was very excited, but after the Ordinary took over the Internet I grew quite tired of the hype and super duper scientific skincare. Since then I haven't repurchased anything from NIOD. I feel I am a skincare nerd, but I guess not geeky enough? Anyway, NAAP is one of the better products I think. I reached for it whenever my skin felt spotty and NAAP seemed to tone it down: I avoided zits and continuing redness. Could repurchase if needed? Full review here. Phew! That was a lot of empties. Have you tried any of these products or used up something lately? Products marked with * were pr samples. 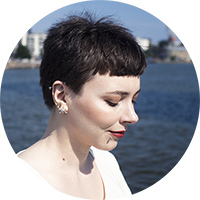 I've received products for review from January Labs, NIOD and Rouge Bunny Rouge, but also purchased a lot with my own money. All thoughts honest and my own, there are no affiliate links. NIOD is a Deciem (main-company of Hylamide and the Ordinary) sub-brand I was first very impressed by, but after testing most from the line I noticed I wasn't too keen on some of the products. Not because they were necessarily bad, but just didn't do it for me. I was dubious if I would have enough to say for publishing a proper review of this mask, but weeks after starting the draft I decided to bite the bullet and finish typing. I hope the review of this mask, FM aka Flavanone Mud, appeals to your interest. 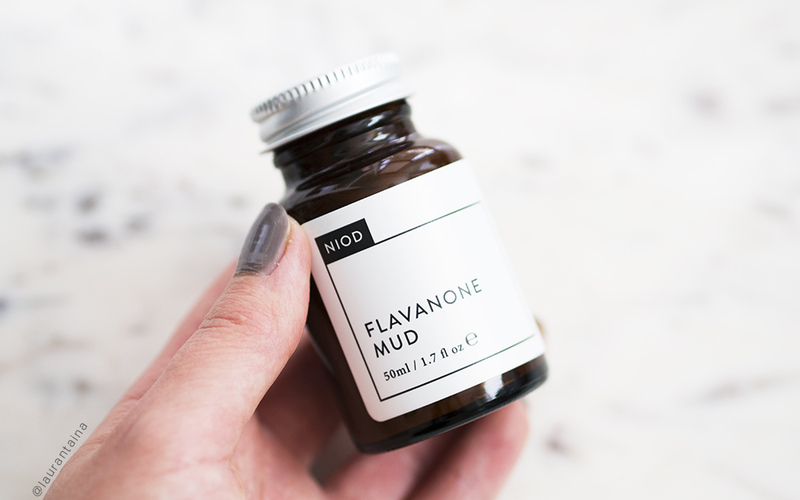 Flavanone Mud is a wash-off mask – or like NIOD defines it: "a three-phase rinse-off decongestion system" with a purifying, protective and responsive phase. I'm openminded to the results of this mask, but I must admit the description sounds a bit like 'science-washing' to me. You can read the lengthy description of the approach on the NIOD website, but basically what I've understood the benefits of the mask is removing surface impurities (oil, sebum, pollution, cosmetics etc), creating a physical shield against external buildup and promoting health and longevity by fighting against environmental congestion. FM should be applied as a thin layer on cleansed face and rinsed off after ~10 minutes. The mask starts to tingle within one minute after the application. It's a stronger tingle than I've used to, but not an unmanageable burning sensation like I've experienced with some exfoliants. It's more like a very, very cooling feeling. As if I was having a facial massage with needle thin icepicks. I let the mask dry for about 10 minutes and rinse it off. After washing my face does feel slightly cooler and the tingling continues for another ~10 minutes. After multiple uses the tingling feels significantly lessened, at the 3rd application it was barely noticeable. I find "if it tingles it's working" as a common misconception: redness, tingling and burning sensations are all signs of irritation. However, FM doesn't feel that harsh to me, but does raise some minor concerns. There are a couple of cons in this mask: first, the packaging. It's a glass jar with no spatula, what I'm supposed to do - stick my finger in it? Yikes. I don't consider myself as a bacteria phobic, but even I have my limits and it's sticking my fingers into a jar. Secondly, it's mud. Mud dries. Every time I open the jar I'm letting in some unwanted air inside and any product near the jar's rim starts drying, which worries me. Wouldn't a tube packaging would be potentially more effective and clean? It might ruin NIOD's glass bottle aesthetics, but I'd convenience over pretty packaging. My second issue with this masks. To me it smells like green olives and salty brine. I detest olives. Fortunately the scent isn't strong, but takes getting used to. According to COSDNA analysis, most of the ingredients are safe and non-comedogenic. Many of the ingredients are viscosity controllers and preservatives with a couple of solvents. To name a few: kaolin clay is a colorant and bulking agent - I would imagine it gives NIOD FM its clay-like consistency. There is a couple of moisturising ingredients, which make NIOD FM not very drying despite having a lot of kaolin. Bisabolol is anti-inflammatory ingredient and isodecyl neopentanoate a synthetic ester and emollient. 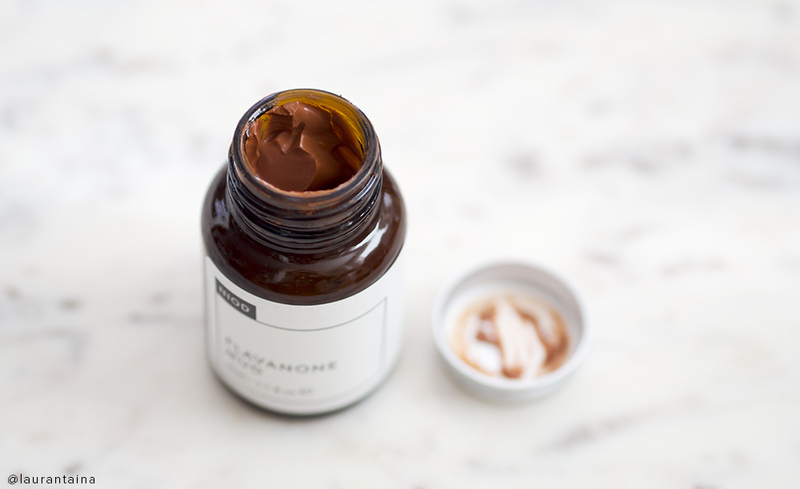 If synthetic or preservatives ingredients are a concern to you, then Flavanone Mud might not be a product for you. After a couple of uses I couldn't tell if my skin looked much different, but it felt. Very smooth, clean and balanced - as if I had just had a small facial. No signs of extra redness or irritation, except my usual redness on the cheeks and around my nose. No tightness or feeling of drying either, which I've experienced with most mud or clay masks. FM is on the nicer side compared to similar masks and a potential pick-me-up for your skin. However I didn't find the results too significant each time so I doubt I would repurchase it. Also the packaging might give a headache to fellow bacteria phobics. What's your favorite mud mask? Would you be intrigued to try the NIOD FM?